Quality headphones and earphones are available in different types and styles. They can improve your experience when listening to music, either from a portable device such as an MP3 player or a high-powered audio system like a home Hi Fi System. What Are The Different Types Of Headphones And Earphones? These typically have the poorest sound reproduction, but are fine for use with MP3 players. Due to the extra features, noise-cancelling headphones are generally more expensive than headphones without this technology. What Do I Look For In Headphones? Budget - Your budget may dictate what type of headphones you buy. Earbuds are perfect for the smaller budget but if money is no object then you'll find some fantastic over ear headphones. How often you will use them - If you are looking for headphones just to pop in every now and then on the bus then sound quality might not be a big concern. In this case, earbuds would be the ideal purchase, but if you are going to be listening daily and treasure sound quality then you should buy over ear, on ear or wireless headphones for a superior listening experience. Where you will be listening - If you are buying headphones for the daily commute and beyond then noise may be an issue. The solution for this problem is a pair of noise cancelling headphones. Generally the best noise cancelling headphones are over ear earphones but online at Harvey Norman you'll also find earbuds and on ear headphones with noise cancelling features. 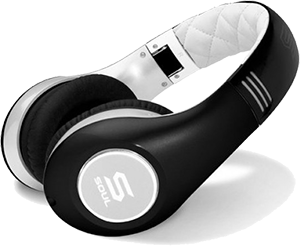 Style - For some people, having stylish headphones is just as important as having headphones with good sound quality. With all the top brands to choose from in a huge range of colours and designs you are sure to find a pair to suit your individual style. There are even headphones that feature interchangeable headbands. Portability - Are you buying headphones for travelling or just for listening at home? Over ear, wireless and on ear headphones can be bulky making them difficult to store away when not in use. If this is an issue then browse through the selection of travel and foldable headphones that are designed to be easy to pack away and transport. Shape - Earbuds come in many different shapes and sizes so be sure to pick headphones that will fit securely in your ear. In addition to a secure fit if you intend on listening for long spells then you'll want a pair that dont cause discomfort over time. Remote and Mic - Many earbud earphones comes with a built-in microphone and remote so if you are intending on using the headphones with your smartphone then it makes sense to get a pair with this feature. Comfort - Listening for hours on end on headphones can become an uncomfortable experience on the wrong headphones, so be sure to take comfort into consideration. Check earphones for cushioned headbands, cushioned ear cups and other such features that are intended to eliminate any discomfort that comes with long spells of listening. Noise Cancelling - Outside noise can affect your listening experience so to truly immerse yourself in music, movies and more shop for a pair of headphones with noise cancelling. Noise cancelling headphones work to drown out noise from your surroundings, leaving you to enjoy your music. Microphone - In the midst of a song the last thing you want is to have take of your headphones and fish in your pocket to answer your phone. Many over ear headphones feature built in microphones so you can enjoy hands free calls using your earphones. Sound Range - With headphones you are more or less guaranteed that the more you spend, the greater the sound quality. Regardless, different headphones excel in different areas; if you predominantly listen to hip and R & B then a pair of headphones with powerful bass is a must; if you listen to Classical music then headphones with an impressive treble range would suit. Range - Some wireless headphones can stream from distances of up to 30 feet, so if range is important to you bare this in mind. Battery Life - How many hours of listening will you get on a full charge? Built in mic and remote - When in the midst of a workout or run you dont want to let your heartbeat drop so choose sports headphones that feature a built-in microphone so that you can answer calls hands free.